This is an 8 1/2 x 11 sized "poster" that I created to help my second grade students to remember to write better sentences. 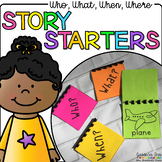 It helps them to remember to include details in their sentences and try to paint a picture with words, including verbs, adjectives, nouns, etcetera. This is a reading anchor chart of who, what, where, when, why, and how in a question mark shape. There are 4 different color themes, one of which is just white with black writing so that you can make it match your room theme. This anchor chart is a great one to give to students to use as a reference while they are learning about the 6 question words. My students put it in a page protector to keep at the front of their binders. I hope it can be useful for you and your students. Thanks so much for looking! 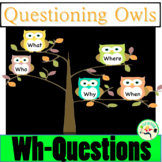 This 6 poster Asking Questions Set includes the following: - Bright, colorful graphics - Who, What, When, Where, Why, & How - Explanation of each questioning strategy The following Common Core State Standards are met in this packet: RL 1.1, 2.1, 3.1, 4.1 RI 1.1, 1.4, 2.1, 3.1, 4.1 Questions? 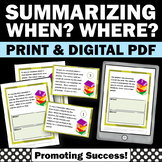 Using this worksheet, students can take note of what they're reading. This worksheet has 6 boxes - one for who, what, when, where, why, and how. 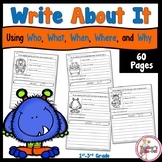 Students can write down notes of who was in the story, why did this happen, how did it happen, what was the outcome, etc. Enjoy!! 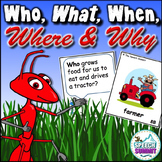 Asking Questions Graphic Organizer: Who What When Where Why and How? 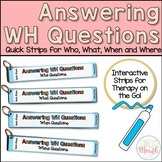 "Wh" Questions Who, What, When, Where, Why? 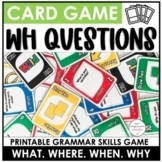 5 W's and an H (Question Words) Bundle Pack- Who? What? When? Where? Why? How?